The Olmsted Falls Board of Education is currently in the process of filling a vacancy due to the resignation of a member. The Board continues to follow a very specific format and timeline that is dictated by Ohio Revised Code (ORC) as well as Olmsted Falls Board of Education Policy 0145 to fill the vacated seat. Twenty-two community members submitted letters of interest outlining their qualifications by the publicized deadline of February 22, 2016. According to the ORC requirements for filling this vacancy, the next time the entire board (all 4 members) meets, the open seat must be filled by appointment. The Board has elected to give each prospective board candidate full consideration and they will interview all 22 candidates. Candidates will be interviewed Thursday, Friday or Saturday of this week (Feb. 25th – 27th). As indicated, the ORC directs the process and the only time the full board is permitted to meet together is when they are ready to make an official appointment. Due to this fact, the four board members will conduct the Thursday and Friday evening interviews in pairs. On Saturday, the full Board will continue interviewing the remaining candidates and make the appointment of the next school board member sometime this Saturday afternoon, February 27, 2016. The Board has called a special meeting for this Saturday, February 27th starting at 8:00 a.m. Once the meeting begins, the board will immediately enter what’s called an “Executive Session.” This is where all board members are permitted to exit the public meeting and engage in private conversation. This option is very limited to specific topics – including board candidate interviews and related discussions. All actions and votes must take place in public session. What this means is that the four current board members will gather on Saturday morning in executive session to interview and discuss the candidates. Once they have reached a consensus as to who will be appointed, they will re-enter into public session and take a vote to appoint the new board member. The newly appointed Board member will serve on the Olmsted Falls Board of Education until a special election is held in November of 2017. OFHS’s gymnasium will be the site of an OHSAA Division 1 Boys Basketball Sectional Final game this Saturday, February 27th. Tip-off between the third-seeded Bulldogs and the fifth-seeded North Olmsted Eagles is at 7 p.m. The winner advances to the District Semifinal @ 5:30 p.m. March 2nd at Elyria Catholic. The OHSAA sets ticket prices and rules. There are NO presale tickets for sectional games. Adult and senior citizen tickets are $6 while student tickets are $4. Per the OHSAA, there are no senior citizen discount, no passes, school IDs or sign-ins that will be accepted. Everyone must have a ticket to enter. 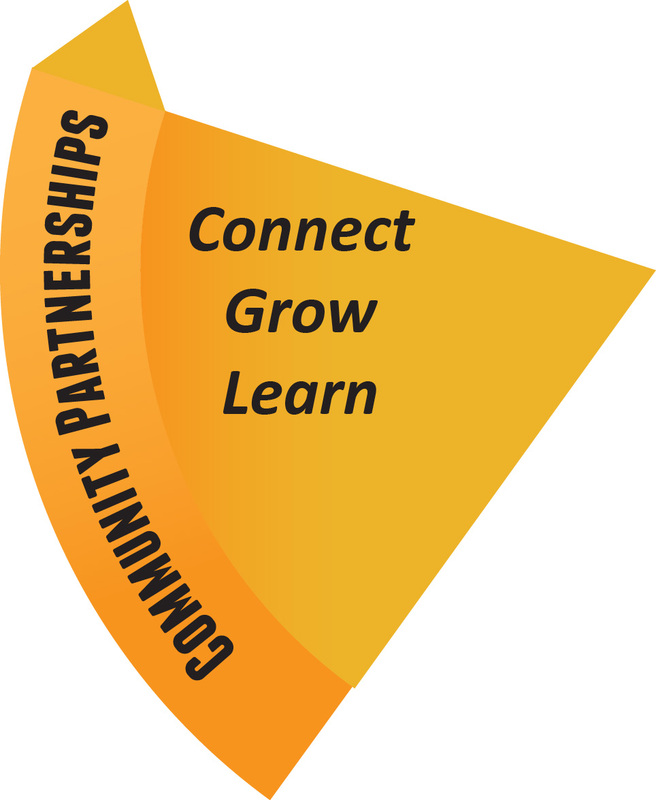 The ticket gate opens at 6 p.m.
Olmsted Falls Board of Education members continue to dedicate a portion of their regular monthly Board meetings to seeing some of the District’s innovative educational programming in action. At the monthly meeting for February, Project Lead The Way’s Design and Modeling class – new at OFMS this year – was the program of focus. OFMS students Noah Barratt, Anna Stenger and Tori Phillips joined course instructor Mrs. Stacey Wisniewski to share more about this new program with Board members. The students even invited – and challenged – board members to participate in a little competition to see who could build a structure using just paper and tape that would support the weight of a box of tissues. It was fun, interactive and competitive! To see a photo gallery of this challenge, click HERE. Superintendent Dr. Jim Lloyd (pictured) and Board of Education member Linda Parkowski were among a number of visitors to the classroom while this impressive project was underway earlier this week. which is a professional 3-dimensional software program. 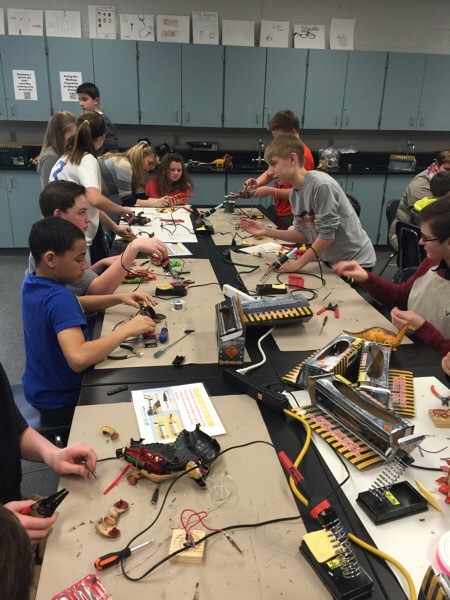 Students are also involved in weekly hands-on engineering challenges that involve problem solving and working as a team while using creative measures. They use science, math, technology and engineering on a daily basis with fun, creative and project-based activities. 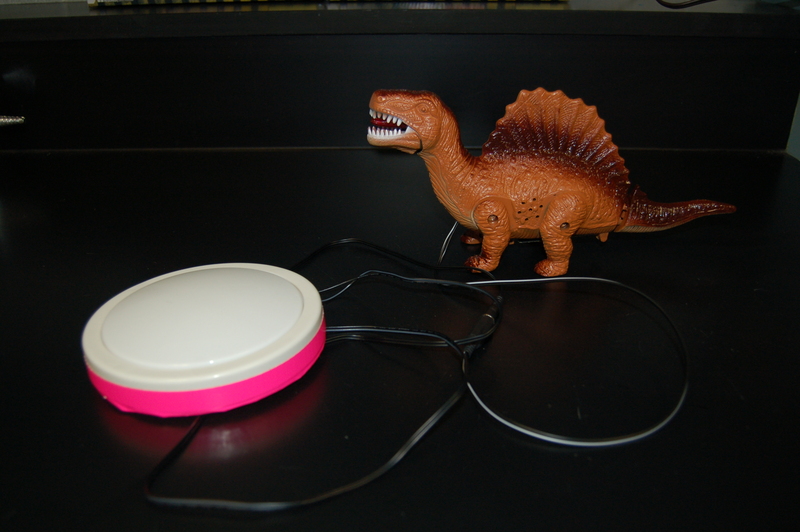 Finished product featuring large, easy to push button to activate the dinosaurs movement and sounds! do the real work of engineers by re-engineering a product for a modified use. The next step of this special project will be to have a toy drive in which OFMS will collect specified new and gently used toys in order to gather even more toys to be similarly adapted and modified for use by students with physical disabilities. The toy drive will occur from February 29th through March 4th. Stay tuned for more details as to the specific toys that are needed. To see a photo gallery of the toy-making project, click HERE. 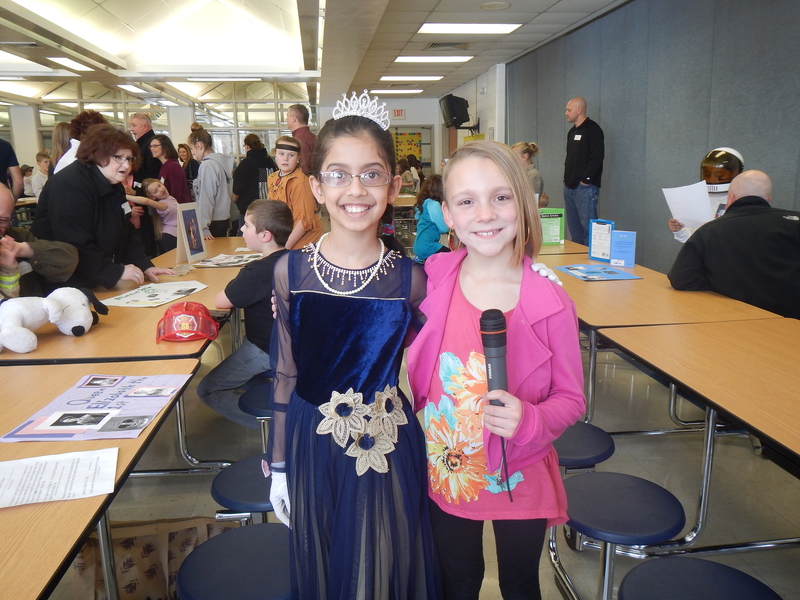 Several classes of Falls-Lenox Primary School’s third grade held a live “Wax Museum” last week. The students spent several weeks working on their research papers. They researched famous people, wrote informational reports and many created Google slide shows. These activities culminated with a Wax Museum, in which the students practiced their oral presentation skills and presented their knowledge and ideas to classmates, friends and family members. The students did a wonderful job! Thanks to the teachers who worked with students in this great learning experience. OFMS student Zowie Hoover is one of three finalists from the Elks NE Ohio District to compete in the Elks Americanism Essay contests at the state level. He is in the grade 5/6 age division. The competition asked students in grades 5-8 to develop the theme: “What I Can Do to Promote Americanism and Love of Country.” The three finalists from each six Ohio districts now vie for being part of the top three essays in Ohio. Results of that competition will be announced at the end of March. Each state’s first-place winners will advance to the national finals, with champions announced in July at the National Elks Convention in Houston. Congratultions, Zowie, who is a student in Mrs. Lamarca’s sixth grade. Best wishes in the finals. To read his entry, click HERE. 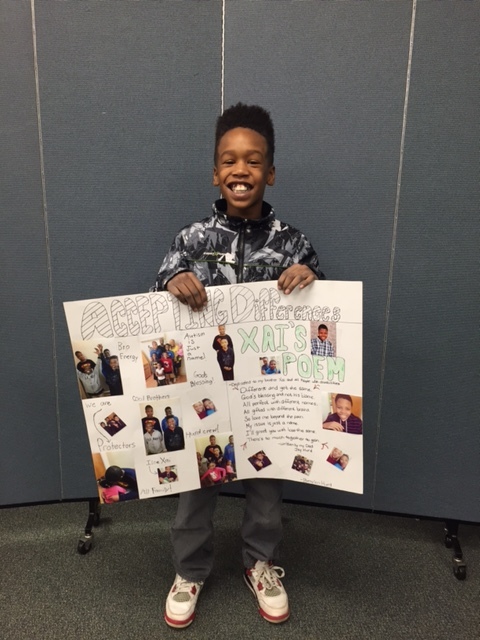 Mrs. Timura’s class at Falls-Lenox joined the Cleveland Cavaliers Read to Achieve program in November. The students read daily and also read extra for the Read to Achieve program. The class was chosen to receive tickets for Monday’s night game for each of the students and their families. Each student received four tickets, which were pre-loaded with $5 each to use at the concession stand. The kids had a great time. Many of them never attended a Cavs game. It was a very fun outing. 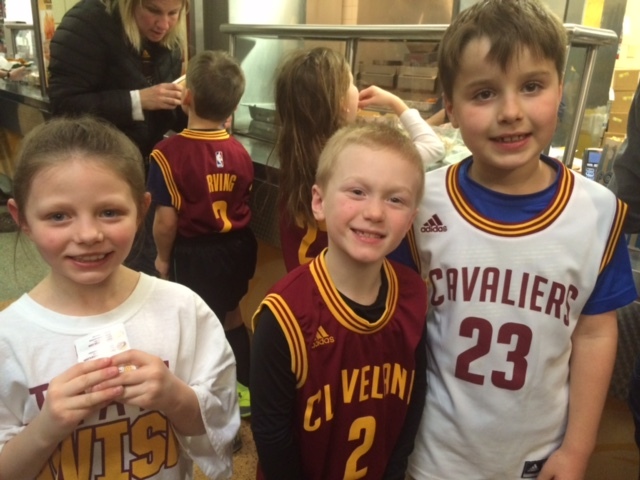 We are grateful to the Cavs for choosing Mrs. Timura’s class to receive these tickets. To view additional photos from the Cavs game, please click HERE. The OFMS L.E.A.D. organization recently held a two-week fundraiser to collect supplies to donate to the Berea Animal Rescue Fund (ARF). 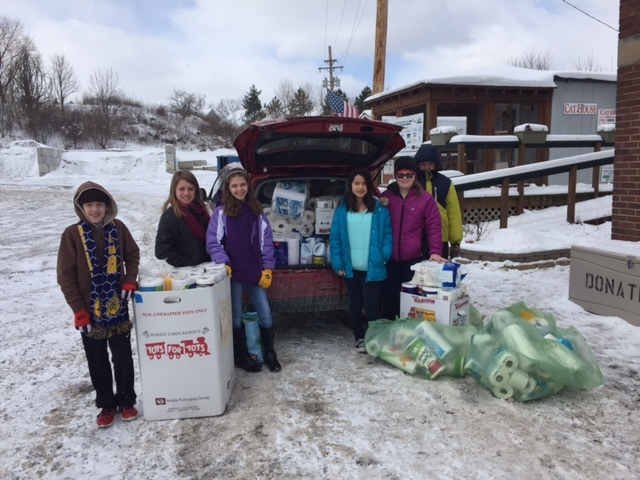 Middle school students collected two car loads worth of supplies, which L.E.A.D. organization members personally delivered to ARF. Homerooms that collected the most supplies participated in a recognition breakfast and received a visit from two cute puppies from ARF to say thank you! Kudos to OFMS and L.E.A.D. members! Earlier today, the Ohio Department of Education released what they indicate are the final metrics for the 2015 local district report cards to the public. This information is currently available on the ODE website. At Olmsted Falls City Schools we take student achievement very seriously. We expect our students to be college and career ready through a strong curriculum and a wide range of “Triple A” opportunities that support a complete education. Olmsted Falls is currently engaged in a strategic planning process to extend our level of excellence even further. We understand the great value we provide to the community and are continuing to work hard to maintain those high standards of distinction for our students and our residents. The latest Local Report Card data from the Ohio Department of Education is unfortunately not very helpful this year. Since the tests that students took last year were so very different from previous years, you cannot get an apples-to-apples comparison. In addition, the results are coming in so late after students took the tests that there really isn’t much value that they provide for our educators this year. Even the state legislature has indicated that this data is not helpful. It is our intention to use it for what we can and move on to more actionable pieces that help our students to be college and career ready. It is important to remember that these were new tests that were drastically different from previous assessments. Many students and parents were greatly concerned with the overall testing environment. This resulted in higher test anxiety for many students, many students opting out of the tests entirely and frustration across the board for all involved. That’s why last year’s tests are no longer being used. So the data this year is not really helpful or actionable. Nevertheless, the ODE has chosen to release the data so it is out there and it is important that we acknowledge that and try to provide our parents and community with an accurate context in which to interpret it. It is of greatest importance to note that Olmsted Falls City Schools does not define its quality of education by any single test or data point. We believe in a more complete educational experience with opportunities both inside and outside of the classroom that prepare students to be college and career ready. At Olmsted Falls City Schools we care about our students and their educational experience. We will continue to gather whatever value we can from these state assessment results and move onwards towards ensuring our students are prepared for the global world around them instead of a specific test. 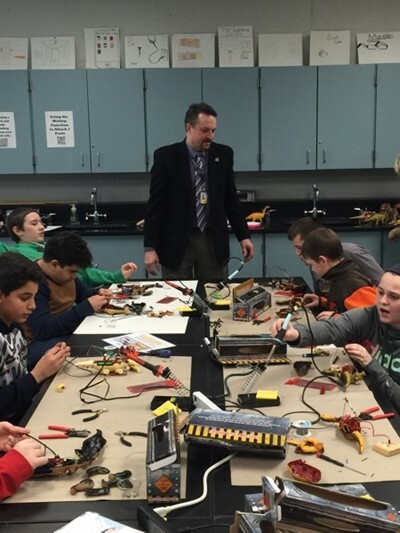 Olmsted Falls City Schools will continue to provide high quality educational programming and engaging opportunities for our students each school day. We will not be defined by the convoluted data being put out by the ODE. Will will continue to identify and use other, more important metrics to measure our student success. Any parents with questions or concerns about the latest local report card information are invited and encouraged to contact Assistant Superintendent Kelli Cogan by email (kcogan@ofcs.net) or by phone at 427-6000. Thank you to all of our outstanding students, staff, administrators and board members who continue to make Olmsted Falls a great place to learn and grow! Registration for new school district students – including all kindergarten students – for the 2016-2017 school year is open and available on-line. Visit www.ofcs.net and click on the “NEW STUDENT REGISTRATION FOR NEXT SCHOOL YEAR (2016-2017)” QUICK LINK at the top left side of the page. Thank you to all who attended the three sessions. The second of four scheduled sessions was held last month and covered the topic of Educational Websites for Students & Accessing Resources Provided by Teachers. To review the information presented during this latest session, please click HERE. The third session, attended by 13 parents who represented students in grades 1-12, was held February 16. It highlighted internet safety & social media. Officer Smolik shared a presentation on Sexting. Dawn Carlin and Jeff VanArnhem, district technology integration specialists, presented information about internet safety precautions that are taken at school as well as precautions parents can take at home to keep kids of all ages safe while in cyberspace. To review the information shown at this latest session, click HERE. The OFHS track and field parent meeting is scheduled for 7 p.m. Wednesday, March 2nd, in the high school media center. Parents of high school athletes who plan to participate in track and field this spring should attend this important meeting. Contact Coach Novotny at jnovotny@ofcs.net for more details. 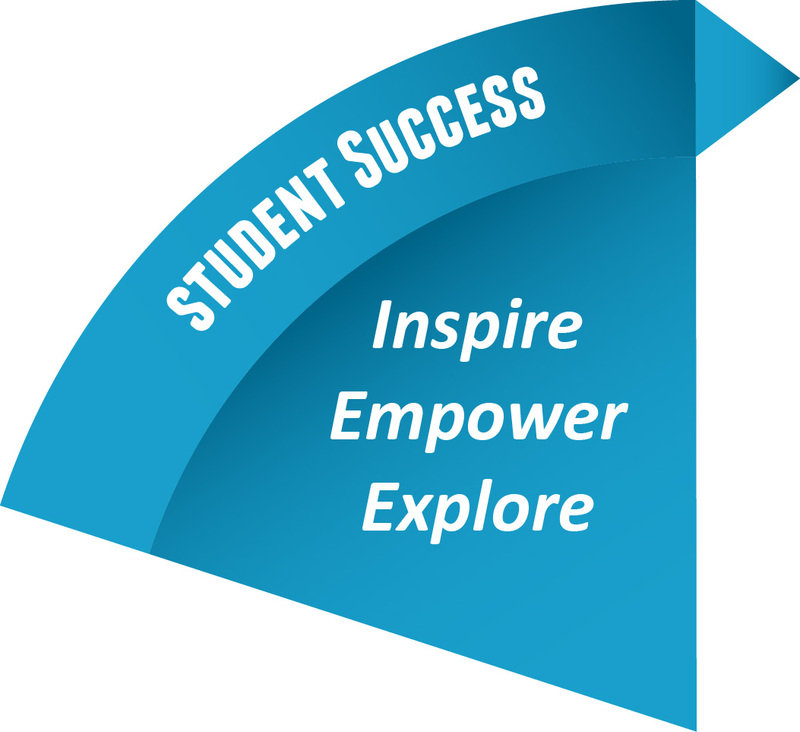 Parents and current 8th grade students: A video of the presentation of the recent freshman orientation meeting is available on the district’s website under Olmsted Falls High School and Counselors’ Corner. A short 3-minute video also is available at that webpage that reviews the schedule process on student registration process through PowerSchool for the 2016-2017 classes. Click HERE to access the OFHS Counselors’ Corner. Students will receive practice scheduling checklists and watch the video in their homerooms this week. Copies of the scheduling checklists are on the Counselors’ Corner webpage. They are located under 2016-2017 Scheduling Info. The scheduling window will remain open from Tuesday, March 1st through Tuesday, March 8th. Please discuss course selections with your student prior to their scheduling date. Students should bring home a copy of scheduled courses at that time. The February 27th bowling fundraiser will benefit the district’s Helping Hands and OFCS Special Olympics. It is from 9:30 a.m. to noon Saturday at Fairview Lanes in Fairview Park. The Olmsted Falls Athletic Boosters’ Night at the Races is March 12th at St. Demetrios Cultural Center, 22909 Center Ridge Road, Rocky River. Tickets are $35 each or $280 for a table of eight. It includes a buffet dinner and soft drinks/wash. Bring your own appetizers, goodies and refreshments to share. There will be door prizes, Chinese raffle and more. This fundraiser benefits students throughout the district. There are 90 horses to buy. The cost is $30 a piece. Does your group want to buy all nine horses in a given race? Contact the group ASAP. Winning horse owners receive a race trophy and $50 in prize money. To buy a horse, contact Terry Atkins, Terenceatkins22@gmail.com. For tickets to the event, contact Brian Fritz, 216-337-4422 or b4421fritz@yahoo.com. To view an event flyer, click HERE. For a flyer detailing a horse purchase, click HERE. The Olmsted Falls PTA Council has a special fundraiser at Chipotle. Eat at the North Olmsted’s Chipotle from 4-8 p.m March 14th and 50 percent of the proceeds will go to the PTA. The eatery is at 26420 Great Northern Shopping Center. All you need to do is bring in the flyer, show it on your smart phone or tell the cashier and PTA will receive the benefits. Senior citizens are invited to a Senior Luncheon at Polaris Career Center’s Mise En Place from noon to 1:30 p.m. Friday, March 4th. But hurry – seating is limited to 30 people. The cost is $12, which includes an entrée selection, beverage and dessert. Reservation deadline, with luncheon payment, is due February 29th at Olmsted Community Center, 8170 Mapleway Drive. Polaris is located at 7285 Old Oak Blvd., Middleburg Heights. Polaris provides real work career technical education in a high-tech learning environment. Chef training, baking and pastry arts and deli and food production are just some of the school’s programs. 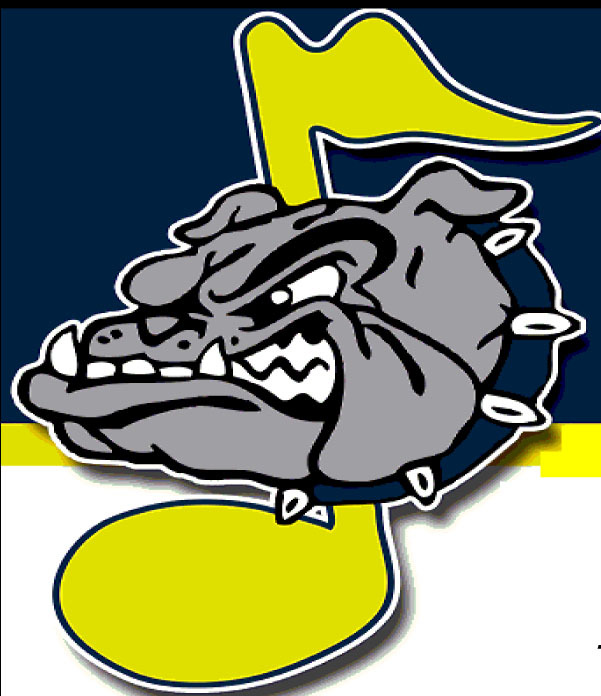 Olmsted Falls is one of Polaris’ six associate school districts. 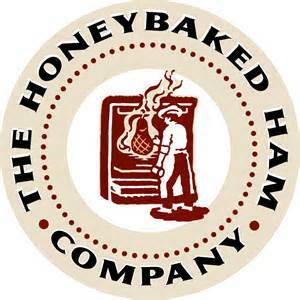 To learn more about the restaurant and its weekly menu, click HERE. Olmsted Community Preschool presents an “Adults Night Out” fundraiser from 6:30-8:30 p.m. this Saturday, February 27th. The event at Razzles/Rockers Café includes all-you-can-eat pizza and wings, limited beverages, DJ, Chinese raffle, 50/50 raffle and more fun. Tickets are available at the door. 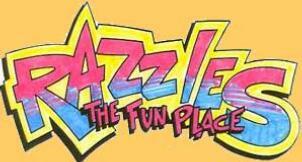 Razzles is at 27128 Bagley Road. 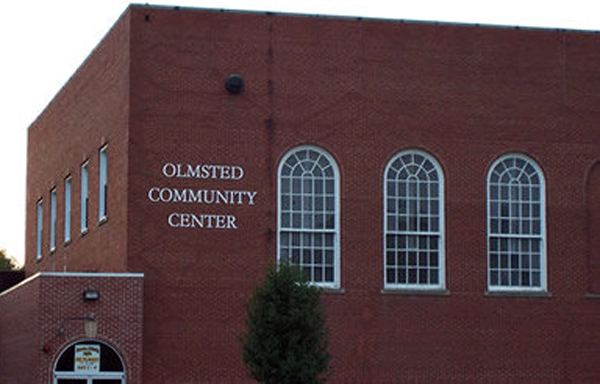 Register from 1-4 p.m. March 13 for the upcoming Olmsted Community Summer League. Sign up is at Olmsted Community Center. You may register and pay for your child’s participation in the league there or do it online through OCC. Registrations without a late fee will be accepted until March 31. Late registrations with a $20 late fee will be accepted until April 15. The 2016 registration form is available by clicking HERE. As mentioned in last week’s blog post, a vacancy was created on the Board of Education of the Olmsted Falls City School District when a Board member resigned. The resignation of Mr. Brian Weisbarth was effective Feb. 8th, and was formally accepted at last night’s regularly scheduled monthly meeting for February. Pursuant to Board Policy 0145, the Board is seeking qualified and interested candidates to consider in filling this vacancy. Any interested applicant must submit a written notice of interest in this vacancy, including qualifications for the position, no later than Monday, February 22, 2016. The written notice must be submitted to Board President Joseph Bertrand at 26937 Bagley Road, Olmsted Falls, Ohio 44138 or via email to jbertrandsr@g.ofcs.net. Eligibility requirements include: being a U.S. citizen; being at least 18 years of age; being a resident of the Olmsted Falls City School District and being registered to vote in the Olmsted Falls City School District. To view the official vacancy posting on the district’s website, click HERE. Registration for new school district students – including all kindergarten students – for the 2016-2017 school year is now open and available on-line. Visit www.ofcs.net and click on the “NEW STUDENT REGISTRATION FOR NEXT SCHOOL YEAR (2016-2017)” QUICK LINK at the top left side of the page. The deadline to register incoming Kindergarten students for the new full-day Kindergarten program is Thursday, March 4th. Pictured from left to right: Emily Sumerauer, Alexis McNamara, Jacqueline Huston and Adam von Glahn with OFMS Principal Mr. Mark Kurz. Not pictured: Zowie Hoover and Amber Blevins. 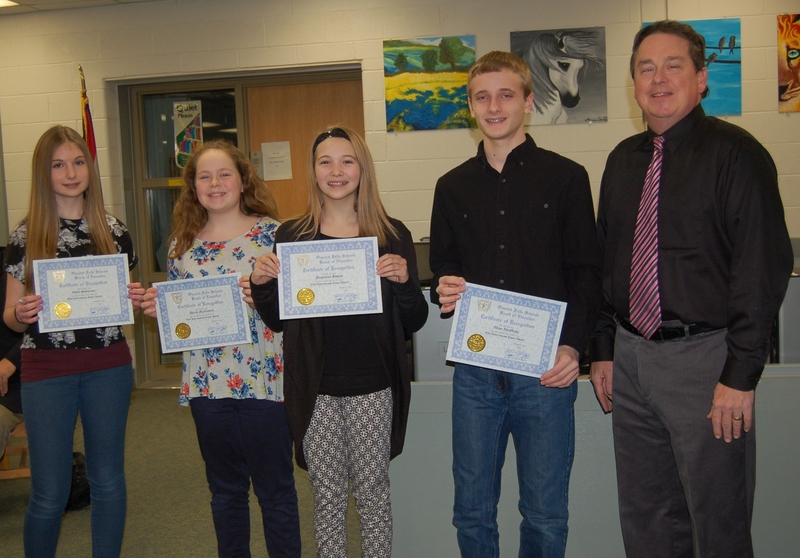 The Olmsted Falls Board of Education recognized six Bulldog students for their award-winning essays in the “What I Can Do to Promote Americanism and Love of Country” essay contest sponsored by The Benevolent and protective Order of Elks. As reported in a previous blog post, students from Olmsted Falls, Berea and Strongsville will invited to participate in the local competition, judged by a panel of 12 Berea Elks members. More than 400 essays were submitted. All six winners in this year’s local contest were from Olmsted Falls! Congratulations to Zowie Hoover, Jacqueline Huston and Alexis McNamara for their award-winning entries in the Grade 5/6 division; and to Amber Blevins, Emily Sumerauer and Adam von Glahn for their award-winning entries in the Grade 7/8 division. OFMS Principal was in attendance at the monthly Board meeting to help present special certificates from the Board of Education. Congratulations again to these six outstanding students, and best of luck to each of them as their essays advance to compete at the NE Ohio District level! (L to R) OFCS teachers Mr. Jesse Judson and Mrs. Lisa Hawk help recognize newest Master Teacher Mrs. Anne Miskimins with Superintendent Dr. Jim Lloyd. Congratulations to the district’s newest Master Teacher – Anne Miskimins. 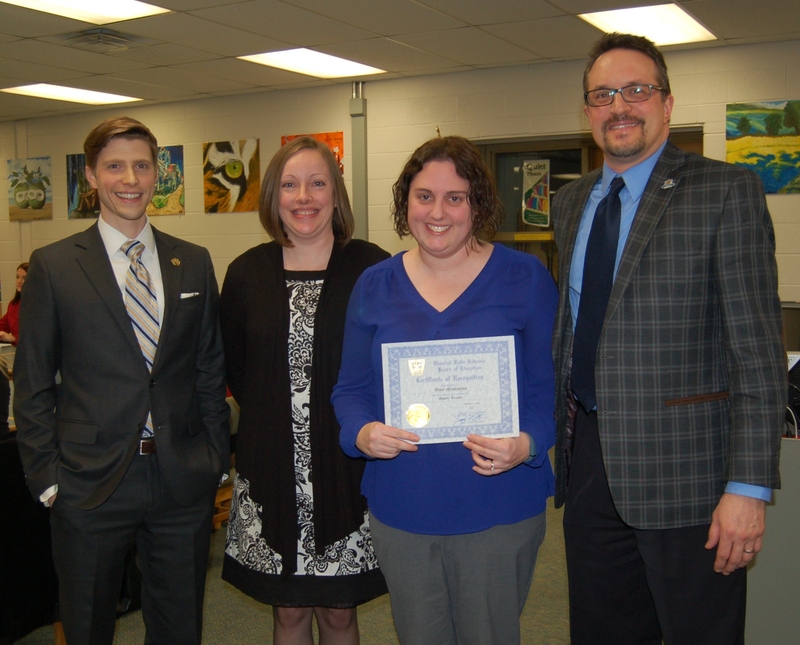 The Olmsted Falls Board of Education recognized and honored Mrs. Miskimins during its monthly board meeting for February, held last night in the OFHS Media Center. Mrs. Miskimins earned the Master Teacher designation by participating in Ohio’s Master Teacher Program and demonstrating excellence both inside and outside the classroom through consistent leadership and focused collaboration to maximize student learning. She achieved exemplary scores for the rigorous documentation of her instructional practices, leadership roles and professional activities. The district’s Olmsted Falls Master Teacher Committee facilitates the program locally with representatives from all buildings and content areas. Mrs. Miskimins’ successful completion of the program brings the number to 14 total Master Teachers in the Olmsted Falls City School District! Congratulations again to Mrs. Miskimins! Congratulations to grade 7 and 8 students who participated in the February 4th Scripps National Spelling Bee at the local middle school level. Participants included seventh graders Becca Abbott, Emma Barnard, Cathy Doherty, Richie Garcia, Kyle Ko, Sanat Subhash and Amanda Wu and grade 8 student Ramiro Rodriguez. The final three contestants were Amanda Wu who finished in first place; Richie Garcia, second and Sanat Subhash, third. First-place winner Amanda Wu will represent Olmsted Falls Middle School at the Cuyahoga County level of the Spelling Bee in a few weeks. Best wishes in the competition, Amanda! The OFHS cafeteria will be transformed into a café ballroom at its annual Ballroom Blitz tomorrow, Friday, February 19th. The OFHS Jazz Band and Golden Expressions will perform for this fundraiser that benefits the district’s entire music experience. Enjoy dancing, finger foods, appetizers, desserts, raffles, door prizes and more. The cost is $10 for adults and $7 for students and ages 65 and older. Anyone donating bakery, remember to drop items off at the school on Friday. To see a flyer of the event, click HERE and sign up to donate any item, click HERE. 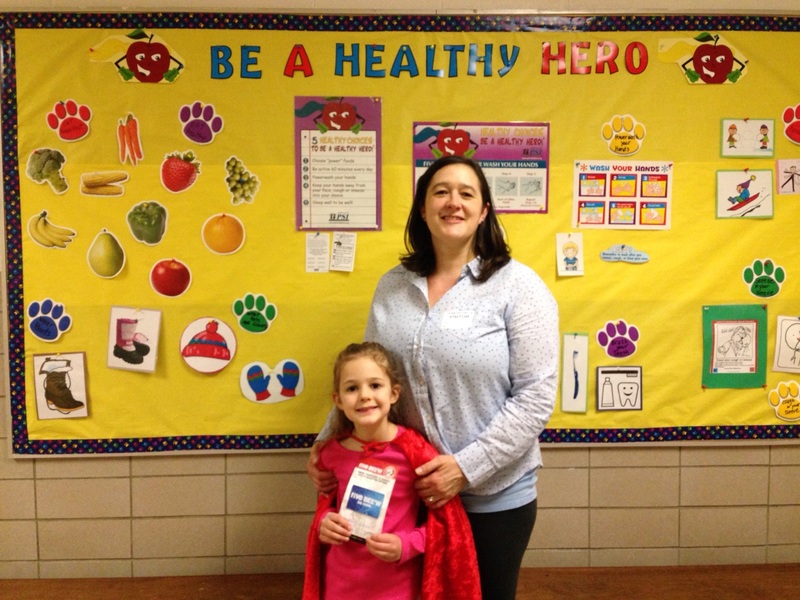 Liam Ray, a Falls-Lenox student and Brielle Gaughan, who attends ECC, are the January Healthy Hero at their respective schools. Besides gaining the benefits of maintaining healthy habits, they receive a Healthy Hero certificate and a $5 gift card to an area store. The program teaches youngsters healthy habits, including power hand washing, eating properly, daily exercise, sleeping well and coughing and sneezing into one’s sleeve. The Hero also earns a prize for doing healthy tasks at home, too. 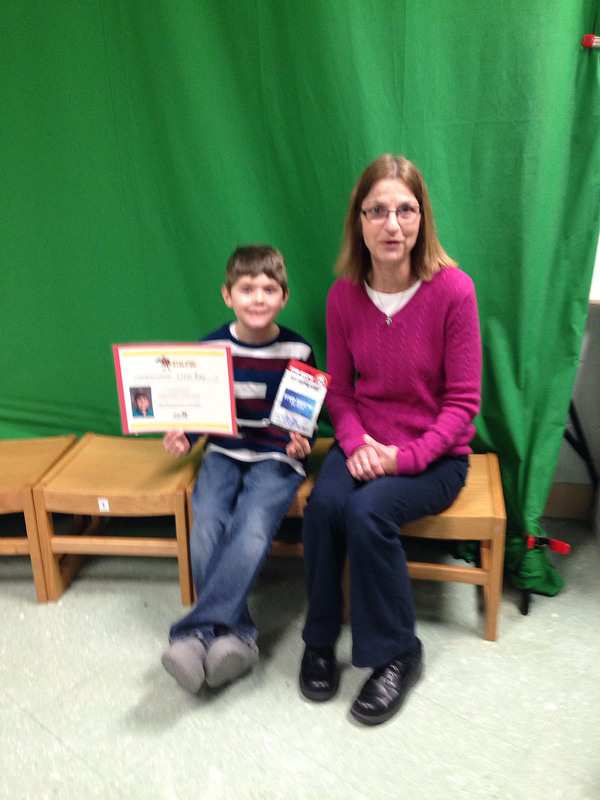 Pictured here with Liam is Sandy Tatro, the F-L media center’s assistant. Brielle is pictured with her mom, Linda. Parents and current 8th grade students: A video of the presentation of last week’s freshman orientation meeting is available on the district’s website under Olmsted Falls High School and Counselors’ Corner. A short 3-minute video also is available at that webpage that reviews the schedule process on student registration process through PowerSchool for the 2016-2017 classes. Click HERE to access the OFHS Counselors’ Corner. Students will receive practice scheduling checklists and watch the video in their homerooms either February 25th or 26th. Copies of the scheduling checklists are on the Counselors’ Corner webpage. They are located under 2016-2017 Scheduling Info. The scheduling window will remain open from Tuesday, March 1st through Tuesday, March 8th. 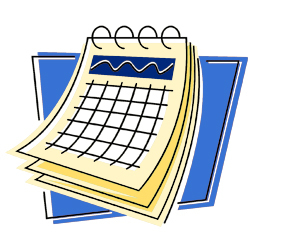 Please discuss course selections with your student prior to their scheduling date. Students should bring home a copy of scheduled courses at that time. There are still FREE College Now Advising appointments available at the high school. College Now is available to help file the FAFSA – Free Application for Federal Student Aid – locate scholarships and interpret SAR – Student Aid Reports. Make your appointment today by calling the OFHS guidance department, 440-427-6116. Appointments are only available through mid-March, so call today! Staying healthy can be a challenge in this weather. Here are a few tips to prevent illnesses. Get a flu shot. Wash your hands often. Avoid touching your nose and eyes. Do not share utensils or towels at home. Stay home when you are ill. Symptoms of a cold last 5-10 days. 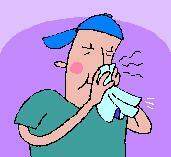 They include runny nose, sneezing, nasal and sinus blockage, headache, sore throat or cough. Flu symptoms are usually worse and include fever, body aches, extreme tiredness, dry cough, chills sweating, muscle and body aches, nausea and/or vomiting and high fever (greater than 102F). If your child has any of the these symptoms, please keep them home to prevent other children from becoming ill. When your child does need to go home from school, please try to pick them up as soon as possible to avoid the spread of further infection. The district offers general guidelines for keeping your child home from school due to illness. An example is the flu, stay home until he/she has been fever-free for a full 24 hours. To view the guidelines for fever, pinkeye, strep throat, vomiting and other illness, click HERE. HELPING HANDS BOWLING BENEFIT IS RIGHT UP YOUR ALLEY – SIGN UP DEADLINE IS THIS FRIDAY! A February 27th bowling fundraiser will benefit the district’s Helping Hands and OFCS Special Olympics. It is from 9:30 a.m. to noon February 27th at Fairview Lanes in Fairview Park. The cost is $10 for bowlers, which includes two hours of bowling, shoes and ball rentals, pizza and drink. Non-bowlers’ cost is $5, which includes pizza and drink. There will be raffle baskets, a 50/50 raffle and bake sale. The event is open to all ages and ability levels, whether in the district or not. Lane bumpers and ball ramps are available upon request. Complete the form by clicking HERE and return it, along with payment, to Mariel Krakowiak at OFHS by tomorrow, Friday, February 19th. Only 20 lanes are available. Lanes will only be reserved once forms and payment are received. Donations for the event will be accepted by clicking HERE. It’s a great time of year to get out of the house and have some fun with friends and family. LAS VEGAS NIGHT IS THIS SATURDAY @ WEST SIDE IRISH-AMERICAN CLUB – WIN CAVS FLOOR SEATS! Feeling luck? Attend this Saturday’s – February 20th – Olmsted Falls Alumni Association’s Las Vegas Night from 7 p.m. to midnight at the West Side Irish-American Club on Jennings Road in Olmsted Township. The night includes a big wheel, dice, black Jack, let it ride, poker, Texas hold ’em and others as well as a 50/50 raffle, side boards and others. There is a cash bar and refreshments by Angelina’s Pizza. Get in the Action!! Win CAVS FLOOR SEATS!! We will be raffling 2 sets of CAVS FLOOR SEATS!! Buy a playing card for $10. One in 52 chance of winning a pair of floor seats to 4/13 Cavs v Pistons game. Las Vegas Night event tickets are $5 in advance and $6 at the door. Call the Alumni Office, 440-427-6030 for tickets or more details. The event is for those age 21 and older. For more information, click HERE to see the event’s flyer. Want to buy a horse? There are 90 of them. The cost is $30 a piece. Does your group want to buy all nine horses in a given race? Contact the group ASAP. Winning horse owners receive a race trophy and $50 in prize money. To buy a horse, contact Terry Atkins, Terenceatkins22@gmail.com. For tickets to the event, contact Brian Fritz, 216-337-4422 or b4421fritz@yahoo.com. Deadline to purchase a horse is February 26th. 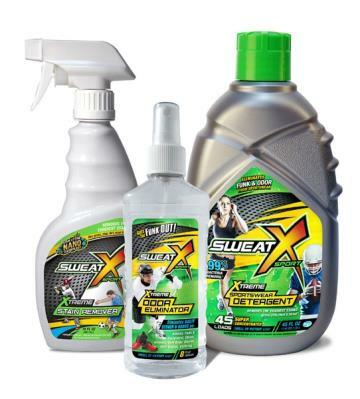 Sweat X Sport Detergent is an industry leading active wear laundry detergent that removes the toughest stains and odors. It is great for sports and band uniforms and the odor spray is perfect for shoes, equipment, bags and more. The OF PTA Council is selling these detergent products. Proceeds from this fundraiser will go directly to program activities and scholarships for graduating seniors. The sale begins this Monday, February 8th and ends February 24th with all order forms and money due that day. Product pick up is from 5-7 p.m. March 16th at the F-L cafeteria. For an order form, click HERE. The 2016 Olmsted Recreation Senior Activities Calendar include two new programs. Senior Craft Day is at 10:30 a.m. on the first Monday of each month at Olmsted Community Center while Mall Walking is at 8 a.m. the last Wednesday of every month by meeting at 8 a.m. at the Great Northern Mall Food Court. Both are listed on the calendar that may be seen by clicking HERE. A Meditation for Healthy Aging session is set for 11:30 a.m. February 9th. 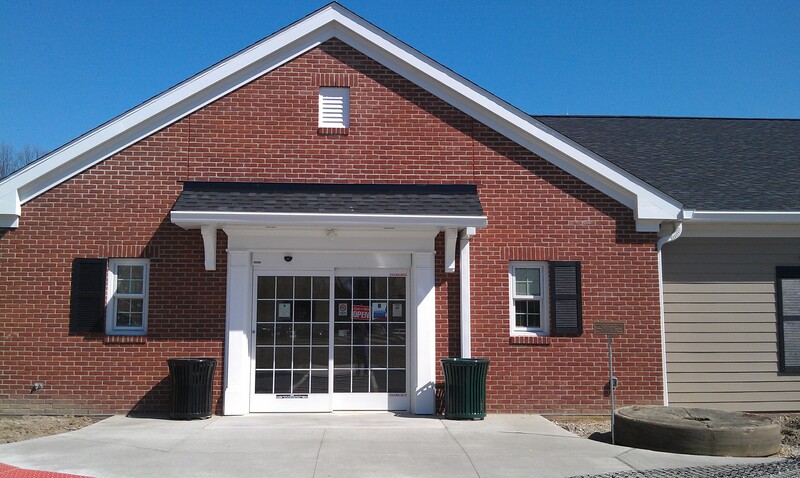 To see a flyer of this event, click HERE and to see all activities at the Olmsted Falls branch library, click HERE. The Olmsted Community Summer League is now accepting for boys and girls baseball/softball leagues for ages 4-18. There are several ways to register, including online through Olmsted Community Center at www.olmstedcc.com. You also may print the form from its website or that of OCSL – www.ocslinfo.org. And returning it, along with payment, to the Center, 8170 Mapleway Drive, Olmsted Falls 44138. Those registering after March 31 will be charged a late fee. Games begin June 1. The co-ed league returns this year. Register a team or individually by contacting Jim Masie, jimmasie@gmail.com or OCC, 440-427-1599. Please be sure to note there will be NO SCHOOL FOR STUDENTS THIS FRIDAY, FEBRUARY 12TH due to a District Professional Development Day for staff. 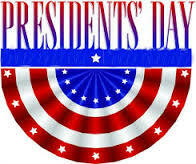 The District will also be CLOSED ON MONDAY, FEBRUARY 16TH in honor of Presidents’ Day. All school buildings will be back in session on Tuesday, February 16th. 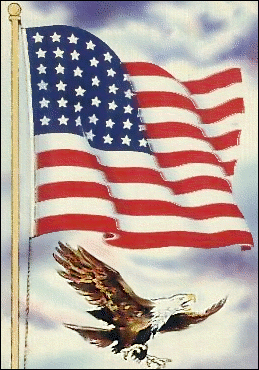 Enjoy the long holiday weekend! The district’s new Full-Day Kindergarten Program – launching for the upcoming 2016-2017 school year – received coverage on TV Channel 5 this week. News 5 reporter Lauren Wilson spent the morning at the Olmsted Falls Early Childhood Center earlier this week to learn more about Olmsted Falls School District’s plans to add a full-day program next year. To view the segment, which aired on Monday, please click HERE. REMINDER: Registration for New Students – including all kindergarten students – for the 2016-2017 school year will be available on-line starting at NOON THIS TUESDAY, FEBRUARY 16TH. THE DEADLINE TO REGISTER INCOMING KINDERGARTEN STUDENTS FOR THE NEW FULL-DAY KINDERGARTEN PROGRAM IS THURSDAY, MARCH 4TH. The OFHS PTA’s 13th annual Battle of the Schools Dodgeball Game is TOMORROW NIGHT – Thursday, February 11th ! Come out and support your school team at the game that now starts at 7 p.m. in the OFHS gym. PLEASE NOTE THE NEW START TIME IS 7 P.M. There is NO SCHOOL Friday, February 12th, so come on out and support your teachers and building staff as they compete for the coveted BATTLE OF THE SCHOOLS trophy and bragging rights for the next year! Tickets are $4 for students, $6 for adults. They will be available at the door. Concessions and face painting, provided by the Junior Class, will be available. There will be free throw basketball shots during breaks and a 50/50 raffle. All proceeds from this event will benefit the High School Scholarship Program for the Class of 2016. Cheer on your team and support an excellent cause! Just a quick reminder that the “Standards-Based Grading: Special Evening Presentation for Parents” with guest speaker Rick Wormelli – which was scheduled for 6:30 p.m. tomorrow night, Thursday, February 11th at OFHS – has been cancelled due to a conflict. Olmsted Falls Board of Education Member Brian Weisbarth has submitted his letter of resignation citing a need to spend more time on personal matters. The resignation is effective immediately. The Olmsted Falls Board of Education will officially accept Mr. Weisbarth’s resignation during the February 17, 2016 regularly scheduled meeting. 2. The Board shall seek qualified and interested candidates from the community through the news media, word of mouth, and contacts with appropriate organizations. 3. Ask qualified residents who are interested in filling the vacancy to submit a letter of interest outlining the candidates qualifications no later than February 22, 2016 to the attention of Mr. Joe Bertrand, President, Olmsted Falls Board of Education, 26937 Bagley Road, Olmsted Falls, OH 44138. 4. Appoint the Board Member from the pool of candidates within thirty (30) days after the vacancy occurs (on or before March 9th). If the Board is unable to make such an appointment by March 9, 2016, according to Ohio Law, the local probate court will fill the vacancy. Once appointed, the individual will serve as our board member until a special election is held in November of 2017. The winner of that election will take office on January 1, 2018 and serve until January 1, 2020. 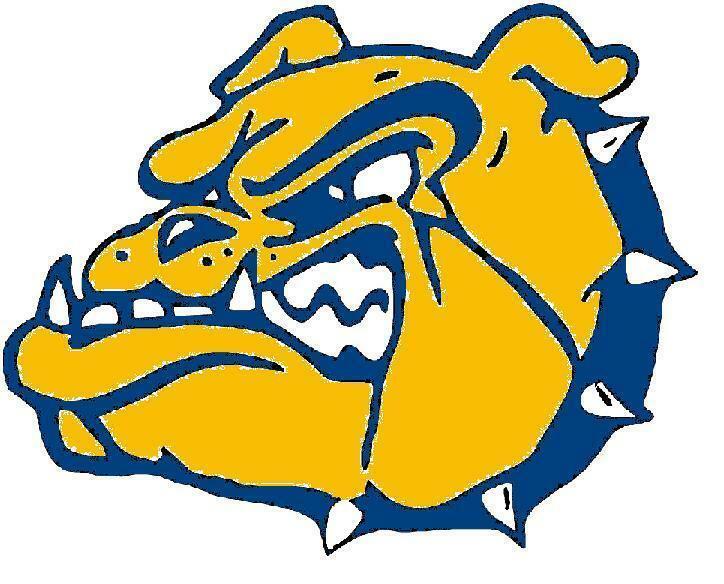 Superintendent Dr. Jim Lloyd notified all Bulldog parents of the vacancy – and the process that will be getting under way to fill it – in an email sent out this afternoon. To view a copy of Dr. Lloyd’s email to parents, please click HERE. 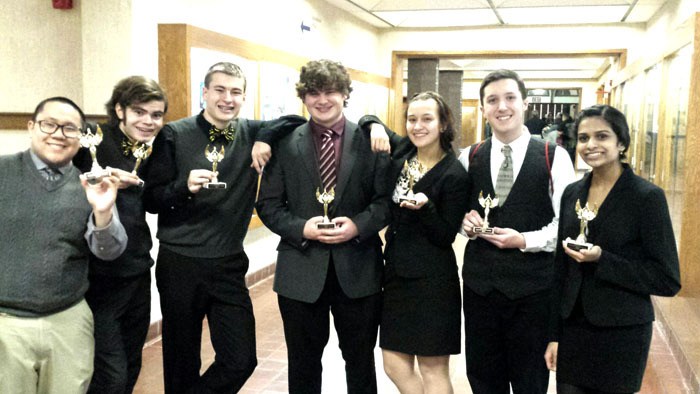 EIGHT OFHS STUDENTS ADVANCE TO SPEECH STATE TOURNAMENT! Pictured here, from left, are Zach Boscarello, Jake Wrege, Bill Wendling, Jake Conder, Ashley Campbell, Cole Zehe, Esha Vartak. Not pictured, Matt Fox. Last weekend, eight students qualified to compete in the Ohio High School Speech league State Tournament at Princeton High School in Cincinnati March 4th and 5th. Seniors Jake Conder and Matt Fox qualified in duo interpretation as did sophomores Jake Wrege and Bill Wendling. Senior Ashley Campbell and freshman Cole Zehe qualified in humorous interpretation. Senior Zach Boscarello will compete in the student congress. Sophomore Esha Vartak qualified in declamation. As a school, OFHS received the BroDoc award by the Cleveland district committee. This award is given to a team that is the most improved and has shown to be a group that is growing and moving in a positive direction. Congratulations to all and best wishes in the tournament! Colin Wilson, an OFMS eighth grader, received the Bright Bisson Award from Rocky River Youth Hockey Friday. 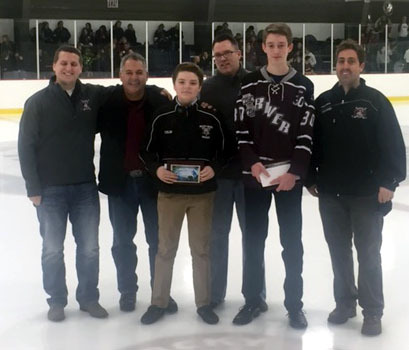 The award is given to two eighth graders for being in the Rocky River Youth Hockey program for at least five years, giving back and volunteering, being coachable and a good role model and showing leadership. Colin will attend and play hockey for OFHS next year. Congratulations, Colin. 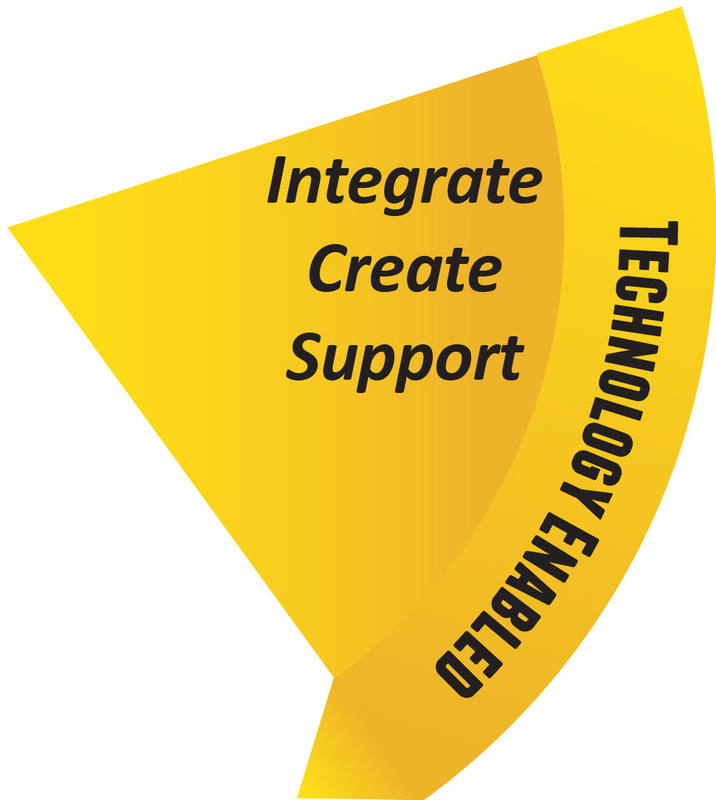 NEXT TECHNOLOGY INFORMATION NIGHT FOR PARENTS IS THIS TUESDAY, FEB. 16TH @ 7:30 P.M. The next Parent Technology Information Night – scheduled for this Tuesday, February 16th – will help parents stay informed about the latest social media and internet safety issues. Parents and current 8th grade students who were unable to attend Monday’s freshman orientation meeting, or need to review information provided at the session, there is online help. A video of the presentation is available on the district’s website under Olmsted Falls High School and Counselors’ Corner. A short 3-minute video also is available at that webpage that reviews the schedule process on student registration process through PowerSchool for the 2016-2017 classes. Click HERE to access the OFHS Counselors’ Corner. Attention parents of students who will attend college or technical school next fall. There is still time to file your FAFSA – Free Application for Federal Student Aid – before the financial aid deadlines. Many colleges have a FEBRUARY 15TH deadline. There are still FREE College Now Advising appointments available at the high school. College Now is available to help file the FAFSA, locate scholarships and interpret SAR – Student Aid Reports. Make your appointment today by calling the OFHS guidance department, 440-427-6116. Appointments are only available through mid-March, so call today! Post Prom’s largest event – Wing Night – is THIS SATURDAY, FEBRUARY 13TH. It is from 6-8:30 p.m. February 13th at Molly McGhee’s Sports Pub, 13169 Prospect Road, Strongsville. The night includes wings, pizza, rigatoni, salad and refreshments of all types. Raffle prizes include hotel stays, baskets galore and corn hole boards. Teachers, coaches, Olmsted community – come out and support the kids. Call Lisa Ciechanoski, 440-781-2511, for tickets, which cost $25. Don’t miss out on this fundraiser that supports the Class of 2016. The OFHS cafeteria will be transformed into a café ballroom at its annual Ballroom Blitz February 19th. The OFHS Jazz Band and Golden Expressions will perform for this fundraiser that benefits the district’s entire music experience. Enjoy dancing, finger foods, appetizers, desserts, raffles, door prizes and more. The cost is $10 for adults and $7 for students and ages 65 and older. The event does need your help, though. Raffle basket items and bakery/dessert goodies are needed and would be appreciated. Bakery should be brought to the school February 19th. To see a flyer of the event, click HERE. and sign up to donate any item, click HERE. BET YOU’LL HAVE A GREAT TIME AT LAS VEGAS NIGHT – INCLUDING A CHANCE TO WIN CAVS FLOOR SEATS! Want to test your luck while raising money for scholarships? Attend the February 20th Olmsted Falls Alumni Association’s Las Vegas Night from 7 p.m. to midnight at the West Side Irish-American Club on Jennings Road in Olmsted Township. The night includes a big wheel, dice, black Jack, let it ride, poker, Texas hold ’em and others as well as a 50/50 raffle, side boards and others. There is a cash bar and refreshments by Angelina’s Pizza. Complete the form by clicking HERE and return it, along with payment, to Mariel Krakowiak at OFHS by Friday, February 19th. Only 20 lanes are available. Lanes will only be reserved once forms and payment are received. ON-LINE REGISTRATION FOR NEW STUDENTS FOR THE 2016-2017 SCHOOL YEAR – INCLUDING FOR INCOMING KINDERGARTEN STUDENTS – WILL OPEN ON TUESDAY, FEBRUARY 16TH AT NOON. PLEASE NOTE: This is a change from what is printed in the 2015-2016 Activities Calendar. Kindergarten Online Registration for the 2016-2017 school year was originally scheduled to begin on Monday, February 8th. This date has been rescheduled to Tuesday, February 16th @ noon. Please do NOT attempt to register an incoming kindergarten student in the current 2015-2016 new student registration portal currently available on the website – this is for new students starting in the district in the current 2015-2016 school year ONLY. Thank you! Many thanks to the approximately 90 parents who attended last week’s special Parent Information Meeting about the District’s new Full-Day Kindergarten Program launching with the upcoming 2016-2017 school year. You can download a copy of the presentation slides by clicking HERE. You can also watch the presentation, which was recorded live, by clicking HERE. Additional information on the new Full-Day Kindergarten Program is also available on the District website by clicking HERE. The College Credit Plus and Junior College Parent Night programs are set for tonight, Thursday, February 4th. 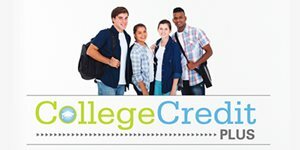 The College Credit Plus Program is set for 6 p.m. It allows students in grades 7-12 to take college course work earning both college and high school credit. This presentation will outline program eligibility, admissions and scheduling. Representatives from OFHS, Lorain County Community College, Cuyahoga Community College and Cleveland State University will speak about the programs and available to answer questions. Junior College Parent Night Program follows at 7 p.m. for parents of juniors who plan to attend a two- or four-year college. The College and Career Counselor will present details on selecting a college, the application process and financial aid. This is an IMPORTANT meeting in getting your student prepared to apply for colleges next falls. Students are welcome to attend. If you are unable to attend either event, the presentations and handouts will be posted on the Counselor’s Corner website Friday. Cuyahoga County Common Pleas Judge Astrab is sponsoring a Community Forum this Monday, February 8 about heroin, a drug that is taking the lives of our youth. It is at 7 p.m. at Falls-Lenox Primary School. The panel also includes Robert Brandt and Dr. Joan Papp. Brandt is the father of Robby, an Olmsted Falls High School grad who bravely fought to try to stay off heroin, but lost that battle. Hear the facts behind the growing heroin addiction among youth in this area and across the country. To view the event’s flyer, click HERE. Please join us next Thursday evening, February 11th, at 6:30 PM in the Olmsted Falls High School Auditorium for a thoughtful look at standards-based grading from a national presenter who has worked in all fifty states as they move towards a more accurate reporting system. The faculty of Olmsted Falls schools is in a multi-year process of moving towards standards-based grading, and parents and the local community have a big part to play in that successful transition. Standards-based grading provides more information for parents on how individual children are progressing in their learning than does a more traditional grading system, and it builds the maturation skills needed to navigate school and the years beyond school. The special evening presentation will provide clarity on what standards-based grading is and what it is not. Hear what colleges are looking for in potential students, and what they are saying about high school grading and admissions. Don’t miss it! ALSO: Please stay tuned for additional information on possible on-site babysitting services for during the event. The 29th Annual OFHS PTA Talent Show is now one for the books. Congratulations to the following students who won in the various grades. 1st place: Lindsey Smits, vocal performance of “Disneyland.” She also was the Overall Winner of the show. 1st Place: Kayla Zapotosky, vocal performance of “When I Was Your Girl.” She also received the Dara Hosta Vocal Performance Award. 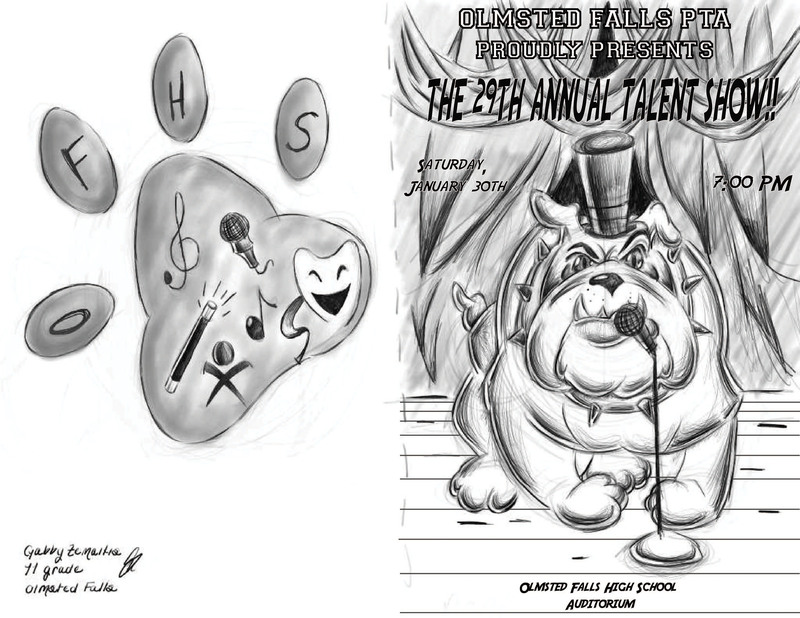 OFHS junior Gabby Zemaitis was the program cover design winner. Congratulations to the winners and all performers, including Erin Hetchler who performed a flute solo of The National Anthem and OFHS senior Jake Conder, the event’s MC. 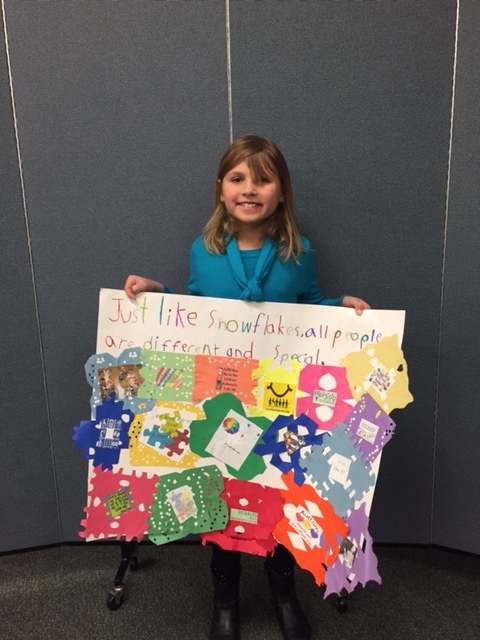 As part of Disability Awareness Week at Falls-Lenox School, students had a chance to participate in a poster/essay contest. Thank you to PTA for sponsoring the winner awards and to Mrs. Scott and Mrs. DiFilippo for organizing the contest. Everyone did a wonderful job. The following are the winners. To see photos of all the winners and their posters, click HERE. 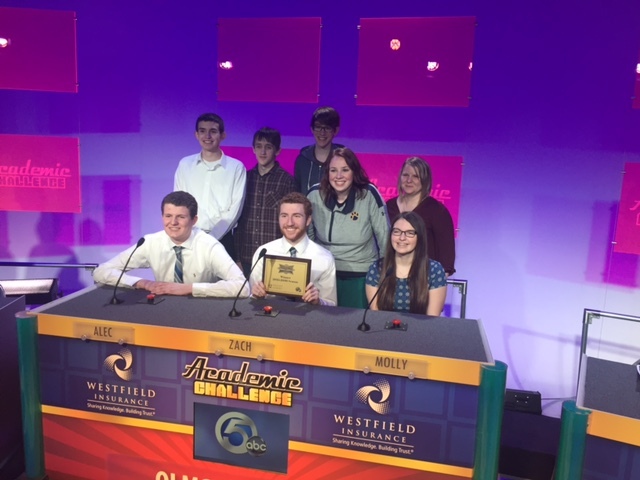 OFHS Academic Team competed on TV Channel 5’s Academic Challenge. It was taped this past week. The episode will air Saturday, April 23rd at 7 p.m. The team played against Maple Heights and St. Ed’s. The OFHS Academic Team members are Alec Sims, Zach Buchta and Molly McCafferty. Alternates are Ben Meredyk, Isaac Rivera and Bennett Graham. The students did a great job. We can’t wait for everyone to see the results! Here are a few pictures of that competition. To view a photo gallery, click HERE. Some OF grads traveled to college bowl games as members of marching bands or cheerleading teams. They were part of the support teams along the sidelines and end zones for their college football teams. The University of Akron participated in the Famous Idaho Potato Bowl against the Utah State Aggies December 22nd. 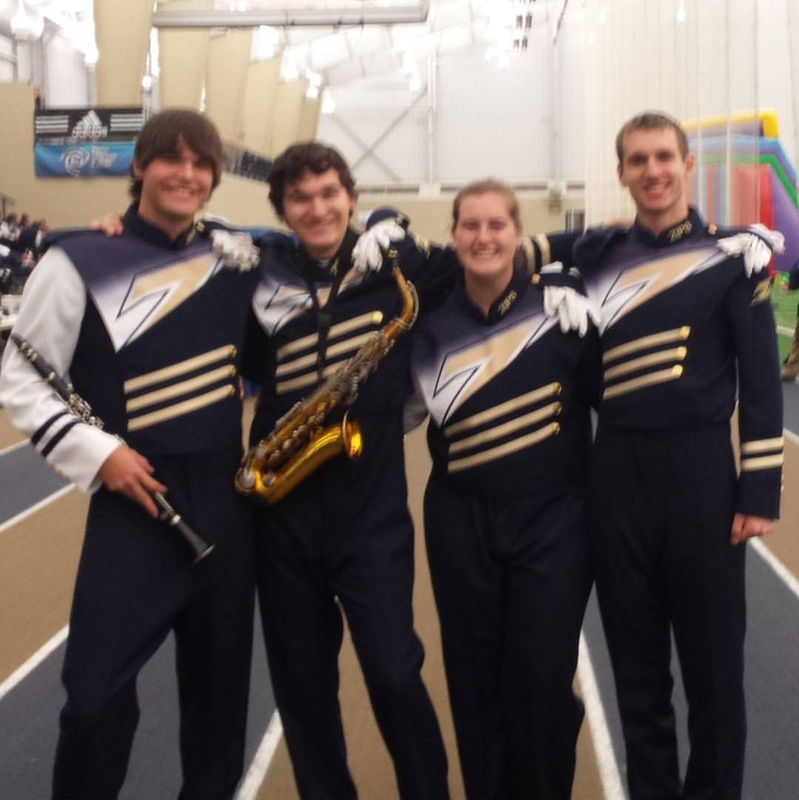 Bulldog grads who appeared in the Zips marching band (pictured at left) are Dan McFadden, Danny Becker, Colleen Prokop and Lucas Schilling. 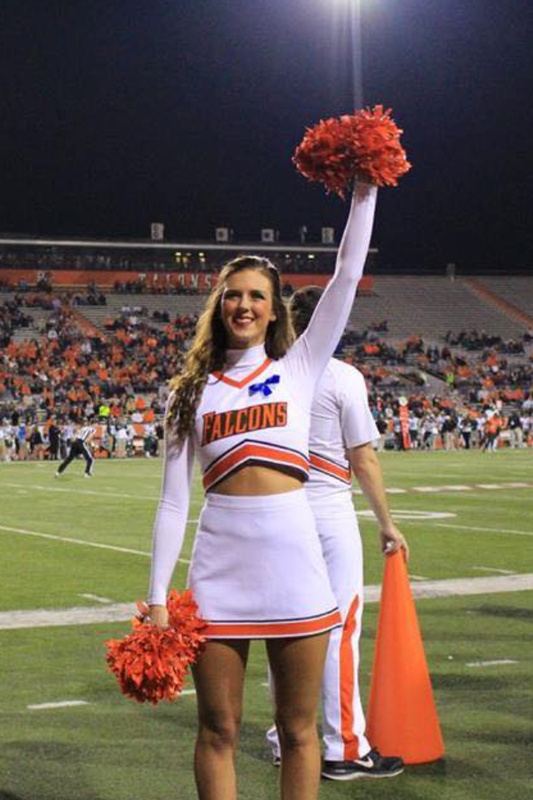 OF alumni Maddie Mendeluk traveled with the Bowling Green State University’s cheerleading squad (pictured at right) to the Go Daddy Bowl in Alabama vs. Georgia Southern Eagles Dec. 23. 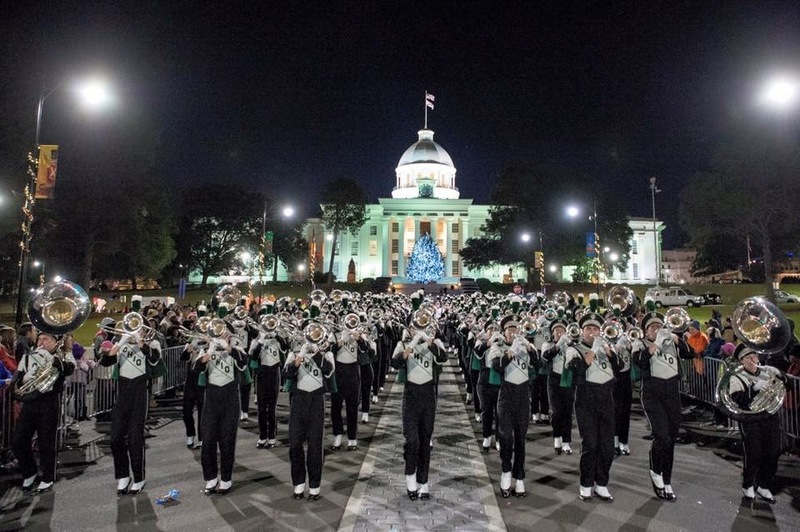 Lori Bertrand, class of 2012, and Tony Kollar, class of 2014, (pictured at left) are members of the Ohio University Marching Band who went to the Camelia Bowl in Montgomery, Alabama Dec. 19th to support the Bobcats football team. The team played Appalachian State. Way to go Bulldog alumni!! To see more photos of the various festivities, click HERE. All OFMS students participated in the qualifying round of the National Geographic Bee in November, with 20 competing in the final competition January 27th at the school. The final competition consisted of questions that National Geographic provided and given orally to each contestants. 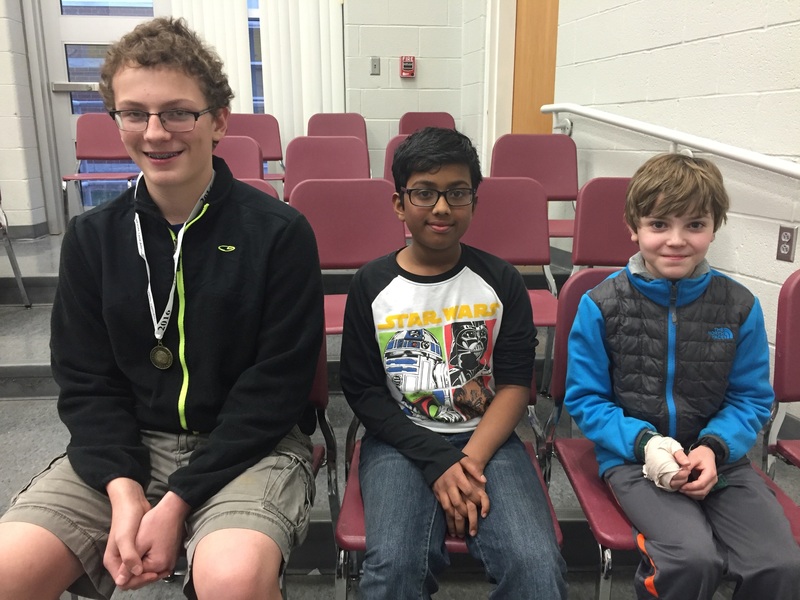 The top three contestants, pictured here, are from left, John Gaba, first place, grade 8; Sanat Subhash, second place, grade 7 and Noah Young, third, grade 6. Grade 6 participants included Katie Voisinet, Jacob O’Connor, Noah Young and Joshua Kuperman. 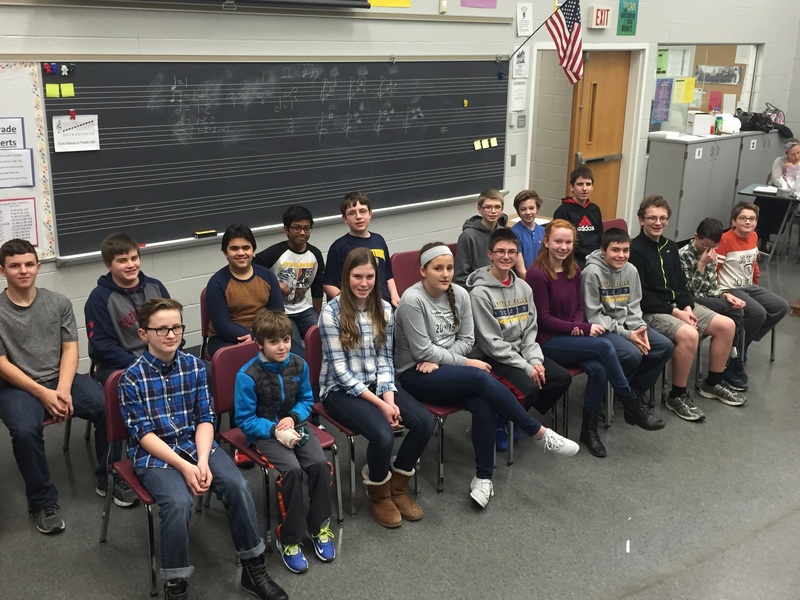 Grade 7 contestants were Morgan Demooy, Xavier Zurawski, Wisam Yaghmour, Noah Barrett, Hank Long and Sanat Subhash. Grade 8 students were Ethan Schlesinger, Joey Lippus, Lucas Lodato, Jaspar Markaran, Nick Gaba, Sam Hubbard, John Gaba, Summer Stevens, Aeden Dobos and Auggie Stallman. The winning question for the middle school competition was: Gray wolves were once wiped out of Yellowstone National Park, but have made a comeback in recent years due to conservation efforts. Yellowstone National Park is located in Wyoming, Montana and which other state? Answer: Idaho. John Gaba, local winner of the OF 25th Geography Bee, will take a qualifying state exam. Results of that exam will determine qualification for state competition in April. The champion of the state contest will win an all-expense paid trip for four to Washington, D.C. to compete at the National level in May. Congrats to all the participants and good luck in state competition. 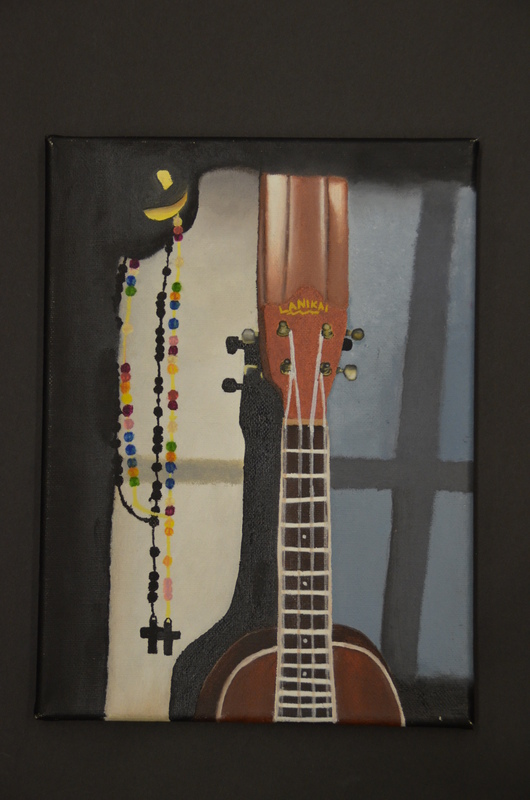 OFHS has three Silver Key winners and eight Honorable Mentions in this year’s Scholastic Art and Writing Award. They were honored from out of thousands of pieces of art work that were submitted this year for Cuyahoga County. Receiving a Silver Key were Abby Harder, Erin Kohler and Marisa Nieves. T hose awarded Honorable Mentions were Kenzie Ballard, Summer Ellis, Destyni Green, Stormie Kadar, Stephanie Koch, Meghan O’Brien, Emmy Olszewski and Diana Vargas. 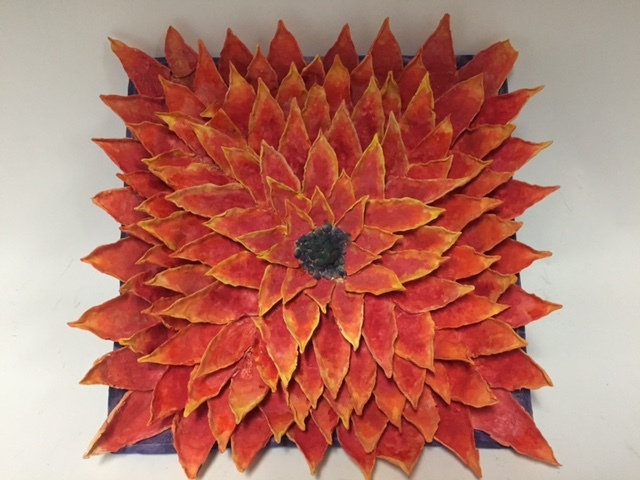 All winning artwork were included in the Scholastic Art & Writing Awards Exhibition on display at the Cleveland Institute of Art’s Reinberger Gallery in January. 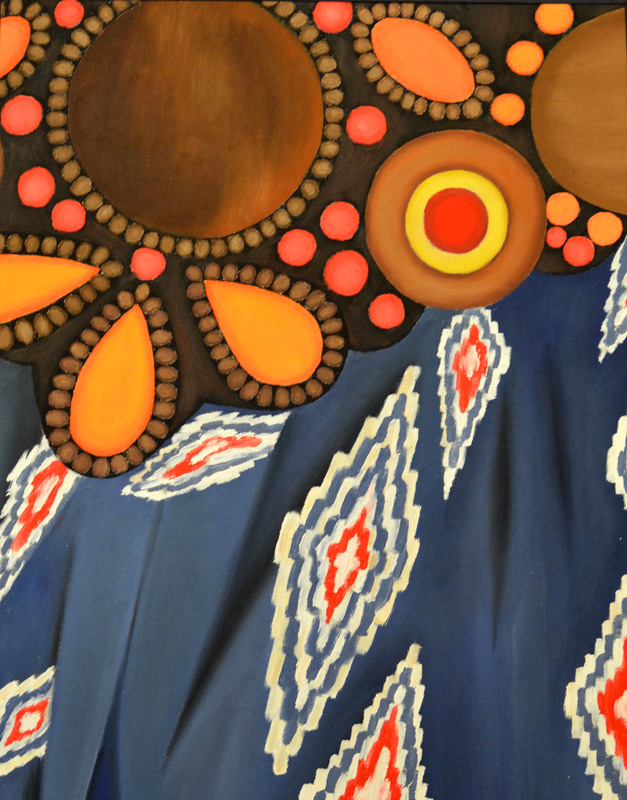 To view a photo gallery of all the artwork, click HERE. Three OFHS students were selected to attend and be part of the “Hy-Tech Club” – sponsored by Hyland, creator of OnBase. The students are Cole Zehe, Chloe Zehe and Mark Drobnak. They were selected from 132 applicants. 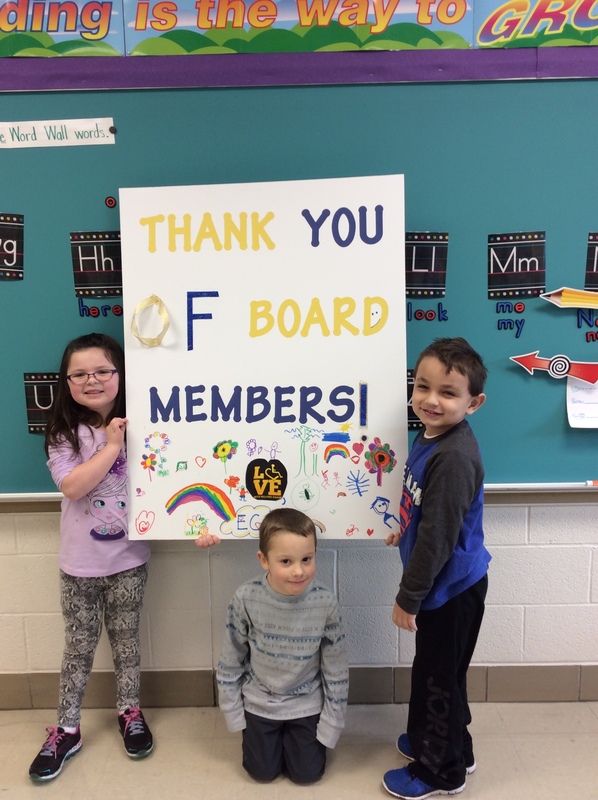 Stephanie Kley’s reading and enrichment students thank the members of the OF school board during School Board Appreciation Month and for their work all year with colorful posters, which the students helped design. January was School Board Recognition Month in the state of Ohio. The OFHS PTA’s 13th annual Battle of the Schools Dodgeball Game is next Thursday, February 11th! Come out and support your school team at the game that starts at 7:30 p.m. 7:00 p.m. Feb. 11th in the OFHS gym. PLEASE NOTE CHANGE IN EVENT START TIME; BATTLE OF THE SCHOOLS DODGEBALL NOW STARTS AT 7 P.M. There is NO SCHOOL Friday, February 12th, so c’mon and support your teachers and building staff as they compete for the coveted BATTLE OF THE SCHOOLS trophy and bragging rights for the next year! Tickets are $4 for students, $6 for adults. They will be available at the door. Concessions and face painting, provided by the Junior Class, will be available. There will be free throw basketball shots during breaks and a 50/50 raffle. All proceeds from this event will benefit the High School Scholarship Program for the Class of 2016. Cheer on your team and support an excellent cause. For information, contact Mrs. Ferrini, 440-427-0894 or claudiaferrini@sbcglobal.net. The National PTA Reflections program encourages students in pre-K through grade 12 to explore and be involved in the arts. This year’s theme, “Let Your Imagination Fly,” had more than 80 local entries involving each of the OF PTA units. These are the 28 district winners that will selected to go forward to the Ohio PTA state round for judging. Primary level: Kaitlyn Williams, first; Elisabeth Flanagan, second; Tessa Chapin, third; Jesse Simon, honorable mention. Intermediate level: Hadley Allen, first; Owen Von Glahn, second; Carly Oliver, third; Maya Smith, honorable mention. Middle level: Lindsey LaPinta, first; Antoinette Cirino, second; Katie Voisinet, third; Becca Abbot, honorable mention. Special Needs Category: Bekka McElroy. Middle level: Claire Oliver, first. Intermediate level: Dominic DiFilippo, first; Aidan Lyons, second; Katie Cleary, third; Alanna Tighe, honorable mention. Middle level: Keeley Patton, first; Harrison Graham, second; Allison Milligan, third. Middle level: Max Limpert, first. Primary level: Josh Voisinet, first. Intermediate level: Gregory Kuehn, first & second; Aaron Bobinski, third. Middle level: Harrison Graham, first; Harrison Graham & Matthew Gluvna, tie for second. Congratulations to district winners and all who participated. State winners will be announced this spring. District winners will be recognized by their school’s Reflections chair this spring. Any state winners will be recognized by the district in May. Looking ahead – next school year’s Reflection theme is “What is Your Story?” Contest details will be sent home this spring and again in the fall. It is not too early to start. The 2016 entries will be due in November. The Olmsted Falls Music Association’s February Musical Notes includes past, present and future events. Photos of the 13th annual Band Invitational at Severance Hall, schedule for the OMEA Solo and Ensemble Contest February 6th in Parma, school band concerts, choral and treble choir students trip to Nashville and much more are included. To view the newsletter, click HERE. The ECC kindergartners continue to view their own version of Pumpkin Jack, which stands, well, leans, in an exterior planter outside the school. They are learning that their own Pumkin Jack truly follows the Pumpkin Jack book, which follows the life cycle of the large squash throughout the various seasons. Will there be another picture of Pumpkin Jack in an upcoming blog? Stay tuned. Attention SENIOR parents! Post Prom’s largest event – Wing Night – is next week. We can ONLY provide Post Prom with the help of parents in our community. Wing Night is from 6-8:30 p.m. February 13th at Molly McGhee’s Sports Pub, 13169 Prospect Road, Strongsville. The night includes wings, pizza, rigatoni, salad and refreshments of all types. Raffle prizes include hotel stays, baskets galore and corn hole boards. You may reserve tables of six or more – the more the merrier! Be sure to wear purple – and your Bulldog gear – when attending this Friday’s Relay for Life Kick Off at the boy’s basketball games. 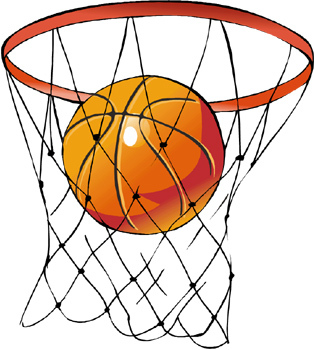 Our OFHS grade 9 boys game begins at 4:30 p.m. with the JV playing at 6 and varsity at 7:15 in the high school gym. There will be a 50/50 raffle along with the OF Athletic Boosters selling baked goods, luminaria for the event and detailed information about the Relay. If you are interested in donating baked goods or helping at our table for the night, contact Cassandra DeLuca, cdeluca@ofcs.net or Michelle LaGruth, mlagruth@ofcs.net. ROLL THE DICE FOR A GREAT TIME AT LAS VEGAS NIGHT – INCLUDING A CHANCE TO WIN CAVS FLOOR SEATS! Attendees to the boys basketball games can help raise awareness by wearing pink to the contests. Hoops for Hope continues February 9th with the freshman game at 4:30 p.m., J.V. at 6 and Varsity, 7:30. To view a flyer, click HERE. The girls basketball Hoops for Hope night was January 30th. See Kobe Bryant’s last game in Cleveland, attend a sold-out Cavalier’s game, view a Monsters hockey game AND support your Community Emergency Response Team with just one ticket! CERT is sponsoring all these for just $50. The cost includes a February 10th Cleveland Cavaliers vs Los Angeles Lakers game and a ticket to an upcoming Lake Erie Monsters hockey game. Olmsted CERT will be the beneficiary of the 50-50 raffle at the game. Come and spend time with friends and cheer on the Cavs! Contact Donna Tindera at donna_tindera@hotmail.com or 440-234-9287 to buy tickets. Olmsted Community Preschool will have its annual open house registration night for the 2016-17 school year Wednesday, February 10th from 6:30-8:30 p.m. Offered classes are for 3 year olds, Pre-K (4 year olds) and extended Pre-K (5 year olds). For more information, contact the officer at 440-235-3869. 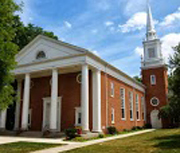 Olmsted Community Preschool is in Olmsted Community Church, 7853 Main St., Olmsted Falls. 1) Indoor Sessions. Fridays from 8-9:30pm. Feb 5, 12, 19, 26, Mar 4, 11. This is a great opportunity to start working on stick skills, conditioning and getting ready for the season. These sessions include training on cradling, passing, catching, shooting, defense, and goalie play. Groups will be broken out by age and experience. Gear required. 2) Spring Season. This will start once weather and field conditions allow. The practice and game schedules will be posted online soon. Early Spring Season registration closes February 21. Register now to ensure a spot! Please visit the group’s website at olmstedfallslax.com to register for the “fastest game on two feet”.